Laying the Foundation Stone 26th July 1879. 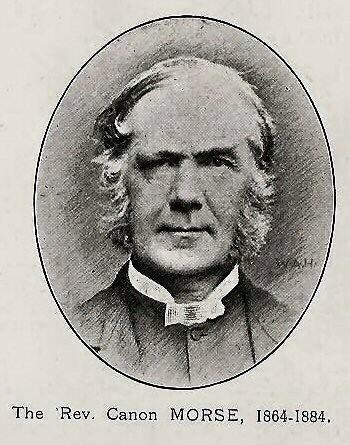 Cannon Francis Morse (1818-86), Vicar of St Mary's in Nottingham (1864-1884), Chairman of the School Board and a founder of the Nottingham High School for Girls, brought the proceedings to a close that day with a few well chosen words. Rev. Morse and his wife, Clarissa Catharine nee Gedge, to whom he was married in 1849 and with whom he had nine (possibly eleven) children, were visitors at Whitehall at this time and were long-standing friends of Mr and Mrs George Moore. 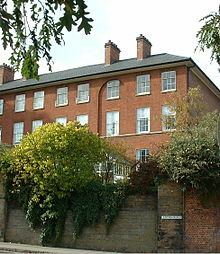 Reverend Morse and his family resided at St Mary's vicarage pictured above (centre), situated opposite the Nottingham Castle Gatehouse entrance and the first residential property to be built in 1809 on The Park Estate, the Castle's former deerpark. The ceremony of laying the foundation of the hall at Mealsgate which is intended to perpetuate the memory of the late Mr George Moore was performed on Saturday by Mrs Moore. After a showery morning the rain stopped, and the considerable number of people who assembled on this occasion had fortunately fine weather, otherwise the pleasing nature of the ceremony would have been to a great extent destroyed. Mrs Moore drove from Whitehall, and at the site of the proposed building was received by the Rev. W. M. Gunson. There were also present Mr W. Fletcher M.P., Canon and Mrs Morse, Nottingham; Miss Bayley, Mr S. Hough, London; Mr S. P. Foster, Killhow; Mr Thomas Moore, Mr and Mrs Banks (sister of the late George Moore), Mr Potter and Mr Penn, Mealsgate; the members of the committee, and a large number of people who live in the neighbourhood. Punctually at half-past two the proceedings were commenced by the singing of a hymn, after which the Rev. W. M. Gunson, in a special prayer, asked for the divine blessing on the undertaking. Canon Morse then said : By Mrs Moore’s request, and in her name, I beg very heartily to thank you for the kind feeling you have expressed towards her by your request that she should lay this stone; and I may perhaps not inappropriately perform this little office for her as I have known Mr and Mrs Moore for many years, and am now, as hundreds of all classes have often been before, a visitor at Whitehall for health’s sake. Mrs Moore desires also to thank you for connecting her dear husband’s name with this building which you are able to raise for for the mental and moral improvement and the general happiness of the working people, for such objects were always very near indeed to his heart. George Moore, indeed, I may say, and you will agree with me in saying it, needs no monument or stone or marble to commemorate his name. His life is his monument. The good which he has done is a monument which will not decay. This brought the proceedings on the site to a close. Afterwards a substantial tea qwas provided for all the workmen on the premises of Mr Thomas Moore.